[prMac.com] Seattle, Washington - Flowboard(R) launches a major update to its flagship free iPad app of the same name with a new look, new partners, new integrations and new features that continue its pace to build and define modern presentation software. Flowboard now has direct access to Adobe's Creative Cloud and is one of the first apps to be released using Adobe's new Creative SDK. Flowboard now allows for navigating presentations via Bluetooth keyboards made by leading manufacturers and added other new features to round out the capabilities of Flowboard for iPad 2.2. With it's integration with Adobe's Creative Cloud, users can now reach their Creative Cloud assets from within Flowboard, allowing for seamless access to PDFs, videos, photos, Illustrator, Photoshop and Lightroom files, and whatever other gems that live in your Creative Cloud. One key feature allows users to select a layer from within a Photoshop file and extract an image asset - unlocking even more creative control over the images you incorporate into your presentations. Additionally, users can now browse the Creative Cloud Market, where they can utilize an impressive curated gallery of graphics, patterns, buttons, icons and photos - giving them even more tools with which to grow and customize their presentations. Flowboard for iPad has been redesigned in a modern, beautiful and stylishly flat aesthetic to reflect change, innovation and usability. Users can now remotely open and close videos and image galleries and advance slides (screens) during presentations via Bluetooth keyboards from leading manufacturers. New rich text editing allows changing the font style and size of individual words in your text boxes for greater creative control of your text, words and story. Creating and editing shapes adds clarity to your text, incorporates designs, and can even allow users to create simple user interfaces. "We are delighted to have such a high quality and innovative app like Flowboard to be one of our launch apps of the Creative SDK", said Jacob Surber, Sr. Manager Creative Ecosystem, Adobe. "We hope that apps like Flowboard and our other launch apps serve as inspiration for thousands of other developers to provide their users access to Creative Cloud and integrate with the Creative SDK." "We are thrilled to launch our latest update to Flowboard for iPad and working with Adobe, to be one of the first apps launching with direct Creative Cloud access, has been extremely exciting," said Brent Brookler, CEO and Founder of Flowboard. "We can't wait to see what our growing user base will create with these new tools and we look forward to exposing Flowboard to the huge number of Adobe Creative Cloud subscribers." 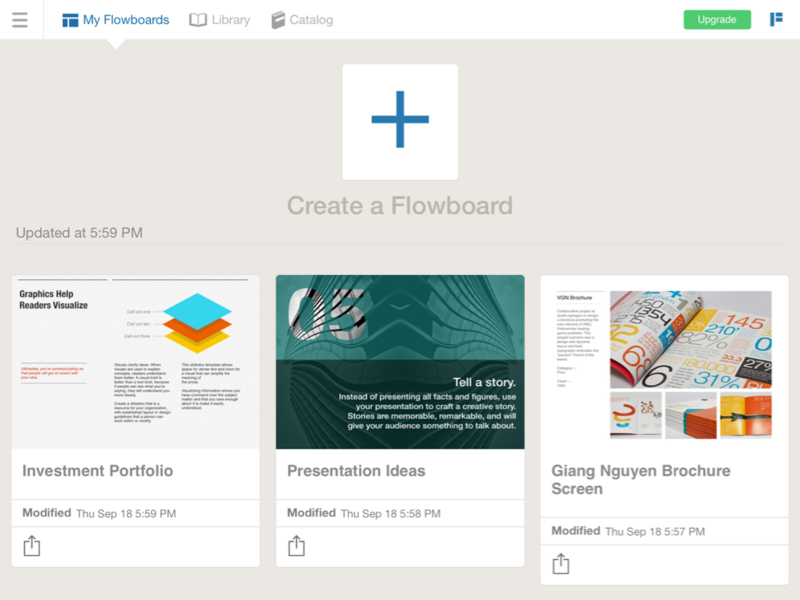 Flowboard for iPad recently won the Tabby Award in the "personal productivity" category. Floward for Mac is the first OSX presentation software to launch first on mobile, according to Apple, and builds on the rising success of its iPad version. Already, Flowboard has over 200,000 registered users since it launched in April 2013. More than 5,000 schools and thousands of professionals are using Flowboard over other traditional presentation tools. In fact, Hollywood actordirector John Turturro of recently told CNET that Flowboard is one app that he's "madly in love with." Flowboard for iPad 2.2 is a free download with premium subscriptions of $4.99/month or $39.99/year. It is available worldwide through the App Store in the Productivity category. Flowboard is a Seattle based company that is building the leading modern presentation software and publishing platform with its flagship apps, Flowboard for Mac, Flowboard for iPad and Flowboard Education. Launched in 2013, Flowboard was born from Treemo Labs, which has been developing and managing apps for some of the biggest brands in the world. All Material and Software (C) Copyright 2013-2014 Flowboard LLC. All Rights Reserved. Apple, the Apple logo, iPhone, iPod and iPad are registered trademarks of Apple Inc. in the U.S. and/or other countries. Other trademarks and registered trademarks may be the property of their respective owners.